If I seem busier than normal this week, it’s because I took a few days off last week. Those days were part of my first-ever journey to Washington D.C. to attend the Ecumenical Advocacy Days conference, an annual gathering of several Christian denominations who attend in efforts to learn, network, and lobby for social justice in our nation. If I seem sleepier than normal this week, I hope that previous sentence will illustrate why! What I may not seem like just yet is fired up, but I can promise you that I am, and I am here to tell you why. The geek in me really loves a good puzzle, and conferences like this are just that when it comes to learning. I took lessons from powerful sermons, practiced strategies in workshops, absorbed stories and statistics and facts, and somehow the fast-paced conference-served puzzle of wisdom comes together, and the image that remains in this case, with this conference, with me, is one of a more confident, capable, and convicted woman. Whoa! The 1,000 folks attending EAD were certainly preparing for the day about 500 of us spent lobbying to Congress on Monday. As I collected my puzzle pieces preparing to do this for the first time, I have more strategies not only to take on conversations with my Reps and Senators, but with anyone. Many leaders throughout the weekend explained the importance of sharing your personal story and the power that can have, especially since political offices are used to policy makers spewing stats at them. When we were to arrive to make our non-partisan case for the importance of human needs, we were going to have our stories to back us up. We would lead with our values, we’d be concise, compelling, and clear. We’d tell them what we wanted to see much more than why we were angry, we’d build consensus in one area and go from there. Trust me, I could go from there. The collection of preachers, speakers, and workshop presenters was not only long but sparkling with creativity, credentials, and missions. I’d like to highlight two of those folks. The keynote speech came from the UCC’s very own General Minister & President, Rev. Dr. John Dorhauer. Yes, I am a UCC nerd and got there early to grab a good seat! Rev. Dorhauer spoke about white privilege and our nation’s cultural, political, and institutional investment in white skin. Highlighting the UCC’s Curriculum on White Privilege, Rev. provided us with another example of how to use your personal story to make a strong point, as he told stories of his experience realizing race in himself and examining that educationally and spiritually. During the Q&A portion of his time with us came the most striking thing he said. He was asked, and I am paraphrasing, what advice he would give to young white men in high school and college about what they could do to fight against systemic racism. He said, “Every time they go in for a job interview, they should ask the interviewer, ‘How many people of color have you interviewed for this job?’, and if the answer is zero, they should refuse to take that job.” That was one of the many times throughout the weekend that a speaker had left the room completely energized. Of course not all of what I learned at EAD was told, taught, or showed to me. The nature of any ecumenical gathering comes with a free side of noticing our similarities and differences with other faith traditions. One frustration I had with the conference was the lack of workshop options for LGBTQ+ specific issues regarding human needs. It certainly would have fit with the theme, but from what I understand, EAD organizers cannot offer workshop options on topics that may alienate denominations that forbid those topics. Interesting stuff, especially since many (if not all) of the speakers at the event included LGBTQ+ people in their messages as full humans created in the image of God who are in need of and deserve care, funds, and rights. It left me wondering, if they can talk about it from the pulpit, why can’t we talk about it in a workshop setting? The UCC HIV & AIDS Network did host a ‘LGBT Briefing Breakfast’ that included an hour of dynamic speakers with powerful stories, but I and other LGBTQ+ folks simply wanted more time, discussion, and consideration as far as conference programming. Rev. Cedric Harmon, who spoke at the breakfast, said it best, “Faith, spirituality, and religion are porous. There’s room for stuff to get in, and there’s room for stuff to get out.” That preached to me and I believe it preached to an elderly Catholic woman who introduced herself to me soon after he spoke those words. Not only did she attend the breakfast out of curiosity, she told me she felt “challenged” by what the speakers at the breakfast had to say because “it’s just not allowed” in her church. She didn’t say anything hateful, she didn’t say she did not agree, she came up to a younger tattooed stranger to admit she was feeling challenged. I believe with more ecumenical gatherings we can begin to have conversations that start like this one did, and perhaps more programming will follow. This interaction also reminded me of something I forget sometimes – I am a bit spoiled to have found a home in the most progressive Christian denomination that affirms my identities. Thanks, UCC! My thanks to the UCC extends even further, specifically to the National office who awarded me the scholarship that allowed me to attend EAD and see all the folks I did while I was there. Upon arrival I joined other UCC young adults, young adult scholars and some teen interns, along with members of Washington D.C. UCC staff and National UCC staff, including Rev. Dorhauer himself. (Of course we talked baseball!) In this reception-style gathering I was introduced to my roommate for the weekend, a 26-year-old young woman from San Diego, CA, Azar Khojasteh. Azar and I share passionate and emotional personalities and became fast friends through the weekend, never even stopping to take a photo together because we were too busy chatting about systemic change, dating, and breakfast sandwiches. She is certainly one of the most inspired young women I have met in a long time, and I am grateful that we happened upon each other and a new friendship in this way. While neither of them could stay to lobby on Monday, I was also able to spend time with two folks at EAD you may recognize from CTUCC, our Legislative Advocate Michele Mudrick and student at Union Theological Seminary Kaeley McEvoy. Kaeley and I enjoyed listening to the keynote speech and were lucky enough to have a dinner together with other UCC folks, and Michele and I kept randomly selecting the same workshops, must be something in the CT water! The three of us also saw each other in our state breakout sessions and in a UCC gathering. Familiar faces from home in a new city were certainly a bonus! Other bonuses are the new friends I made while I was there. (Hi Luciano, Zillah, Nathan, Marcus, and April!) I now have several other UCC and church folks in my age bracket to connect with and that is somewhat rare for me. One evening while we were at EAD, a group of us went dancing and explored a few monuments lit up in the night sky. 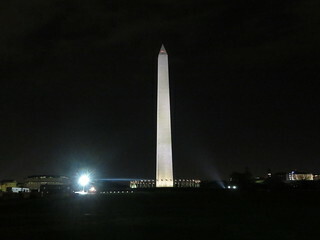 If you’ve never seen the MLK Jr. Memorial Monument, it’s worth going to D.C. just to see that lit up at night. Even though the busy weekend did not leave much time to be a tourist, we still managed to incorporate an evening out. The most unexpected networking opportunity came when I was having an introvert moment during the conference. I figured I’d look around the exhibit tables while most others were off doing something else. Who did I run into but the Rev. who delivered the sermon which spoke to me so much earlier that day, the Rev. J. Herbert Nelson II. I was happy to meet him and surprised to discover that the loud preacher I remembered from the morning was soft-spoken and carried himself with sweetness within in-person interactions. I admire that type of duality in a person, and I asked for a selfie. My favorite networking moment, though? After one of the many speeches, I re-introduced myself to Rev. Traci Blackmon who I met briefly at another event last year, and who happens to be a personal hero of mine. She gave me a hug! The only thing I can call that is a Hero Hug. Gold! Without the multiple perspectives from and interactions with all the people I came across at EAD, I would not have been as organized or influential when it was time to head to Capitol Hill. I am so grateful for the friends and leaders who prepared me for the Lobby Day, as I am for the other CT constituents who lobbied with me. While EAD is a national conference who had 500 people lobby on Monday, there were a group of 10 of us from Connecticut who began the morning with a meeting at Senator Blumenthal’s office. (See if you can spot the CT UCC pastor in the photo with me!) Before we met with David Carpman, the Senator’s Legislative Assistant and Counsel, it was hard to miss the CT themed décor that surrounds this Senate office. UConn Huskies on the walls, an intricate embroidered CT pillow on one of the chairs, and a Capitol building made of Legos! The 10 of us had already spent time during the conference preparing who would introduce our group, who would share stories, who would ask for the Senator’s commitment, who would pray, etc. (Prayer was an important component to incorporate into our Congress meetings, as it distinguishes us as people of faith and makes our meetings stand out from the ordinary.) It was my job to share my passionate opinion about the importance of keeping free school lunch programs, and I shared my personal story of eating these lunches myself when I was in school. My story and plea had some kind of impact, because David only seemed to take notes during that time. The advocates I lobbied with were also clear and strong in their convictions as they shared their stories, and David shared what most of us who follow CT politics already know, Senator Blumenthal agrees that we need to keep funds in human services and not take funds from human service programs to use for military spending. It was an equally powerful and positive meeting which left me feeling less intimidated by this Washington D.C. place I had only ever thought of going to. In between Congress meetings, I attended a public prayer protest at the Methodist Church site near the Capitol building. Several faith leaders spoke and publically prayed in the rainy weather while attendees held signs referencing a moral budget for our nation. Rev. Traci Blackmon gave a powerful message in which she frequently asked, “How are the children?” Rev. Blackmon suggests we ask this question of ourselves in as many capacities as we can. This public prayer gathering held power as individuals and groups passed by us, many wearing those red hats with that white font, wondering why we weren’t running away from the raindrops. We had bigger things to worry about. My next meeting was with Rep. John Larson’s office; I was one of three to lobby in that meeting. Judith Roberts and Julian Barlow of Windsor, CT and I met with Serj Banjac, Larsons’s Legislative Assistant. He welcomed us into Rep. Larson’s office which is certainly smaller than the Senate office we were in earlier, but still adorned with beautiful antique furniture and fabrics. We held a similar conversation with Serj that we did with David, except this time we were able to get more in-depth since there were three of us instead of ten. I lifted my personal story again, and the concerns the East Windsor and surrounding community have with a possible third casino being built in CT, while Julian discussed the importance of assisting veterans, communities of color and their families. Serj was responsive to us and had many thoughts of his own to share which made for a dynamic conversation. I will be following up with him to be sure he plans to hold Rep. Larson accountable to what we discussed. While it may seem like we were preaching to the choir since our CT Congress people tend to lean toward supporting human service programs, it remains just as important for these offices to hear from us. The way I look at it, for every request they receive to take funds out of human services, we should be there five times as often if not more, even if the office agrees with us. While the two meetings I took part in did not require much debate, others who participated in EAD did not have the same experience. Nathan Watts, a friend who lobbied for Arizona, was met with a cold, “We consider those things,” when talking with his Congress person. Part of me would prefer to have these conversations with states that may not agree with our moral perspective, but for my first lobby visit, I’m glad it went the way it did. We certainly prayed with our feet and worshipped with our actions, and as Rev. Dr. Martin Luther King Jr. said, “Nothing would be more tragic than to stop at this point,” and I don’t intend to stop until a moral federal budget is realized, no matter how long it takes. Ecumenical Advocacy Days is an annual held every April. CTUCC and the United Church of Christ have scholarship funds for young adults who wish to attend. Contact Debby Kirk, Director of Youth and Young Adult Ministries at debbyk@ctucc.org for more information.